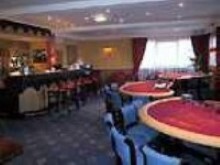 Casino Barriere de Dinard offers English Roulette, Black Jack and Stud Poker table games, 130 slot machines and live poker. Cash games are held 9pm to 3am during the week - from 9pm to 4am weekends and eves of holidays. (Closed Monday and Tuesday - off season). . There is a bar and a restaurant in the casino. Admission is free, gaming currency is euro. Smart dress is required.